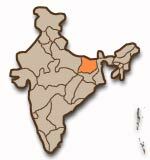 At an average age of 17.2 years, it is placed just behind Rajasthan and M.P. Patna: A large number of girls in Bihar are married before they turn 18, the minimum age prescribed by the law, posing a serious threat to their lives and that of their children. In Bihar, the average age of a girl at marriage is 17.2 years, third after Rajasthan (16.6 years) and Madhya Pradesh (17 years), according to a recent report of the UNICEF. While an alarming 80 per cent of girls get married below the age of 18 in West Champaran district, it is 73 per cent in Nawada, around 70 per cent in Kaimur and Rohtas and 66 per cent in Madhepura district. According to a report of the Population Foundation of India, the situation was comparatively better in Siwan, Katihar, Purnia and Saran districts where the girls married off before they attained 18 years of age were 43 per cent, 47.5 per cent, 48.2 per cent and 51.3 per cent respectively. In Patna district, hardly 40 per cent of girls below the legally permissible age get married and this could be attributed to higher percentage of literacy. At 52.7 per cent, Patna has the highest female literacy rate among districts in Bihar. The UNICEF’s latest report on the state of the world’s children says parents consent to child marriage out of economic necessity, or because they believe marriage will protect girls from sexual assault and pregnancy outside marriage, extend girl’s child-bearing years or ensure obedience to their husband’s household. Senior gynaecologist and professor at Magadh Medical College and Hospital Reena Singh said premature pregnancy and motherhood were inevitable consequences of child marriage. Admitting that there was a rise in cases of pregnancy out of the wedlock among adolescent girls, she said: "Many of these pregnant girls who throng various private nursing homes and hospitals are hardly 14-15 years old". Ms. Singh also said that several married pregnant girls, particularly from rural areas, were unable to tell their age and during examination it was found that a fairly large number of them were well below 18 years. Girls under 15 years of age are five times more likely to die during pregnancy and childbirth than women in their 20s. If a mother is under 18 years of age, her baby’s chance of dying in the first year of life is 60 per cent greater than that of a baby born to a mother older than 19. Even if the child survives, he or she is more likely to suffer from low birth-weight, under-nutrition and late physical and cognitive development. Besides, according to the UNICEF report, girls who marry at a very young age are also more vulnerable to domestic violence and sexual abuse and are less likely to complete even primary education. Singh said the government, besides clamping down on those promoting child marriage, should also launch an awareness campaign against the practice in a big way to sensitise the people to the inherent dangerous consequences for both the individual and the society.